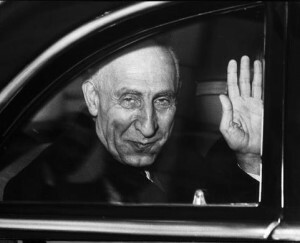 Iranian Prime Minister Mohammad Mossadegh in a photo believed taken in 1951. His nationalist government was overthrown in 1953 in a coup organized by the United States and Great Britain, reinstalling the Shah as Iran’s ruler. Rehmat’s comment is the only one that makes sense. Who are boron, moron, and borat? Three idiots? Can’t tell them apart. You three: why bother to post here? Wrong place for you. Mr. Atkins, Read the comment again. It was intended to show the disconnect between the purported purpose of the prize and who the awardees have been- the most recent being the EU with its wretched pro-war record. More anti-semitic crap from a bunch of m…f – why don’t you take your scimitar and shove it up your not so tender you know where. Rehmat, you forgot that next year the Nobel Peace Prize will be awarded to Netanyahu, Barak and Peres as a team, but only after we are in the middle of a hot war that they have initiated against Iran, and into which they have drawn us, NATO and…. hapless Turkey. They will most certainly be able to point to their phosphorus and depleted uranium bombs as technological advances over the primitive explosives manufactured by Alfred Nobel, and even claim that they have been dropping them for medical research purposes- e.g., to determine the extent of permanent genetic damage that might result if others were to use them less responsibly on a civilian population. Naturally, children would be the primary focus and target in this program, better to enable long term testing as a follow up.